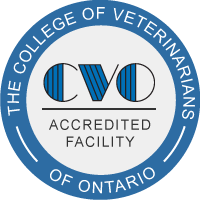 Blue Mountain Veterinary Services has invested in a Class IV Therapeutic Laser to help your pet heal more quickly and more effectively. Laser therapy reduces pain and inflammation, and improves mobility. Pets suffering from a wide range of conditions can benefit from this treatment. Conditions that respond well to laser therapy include arthritis, disc disease, skin conditions, lacerations, cystitis, burns and post-surgical healing. BMVS has invested in a Class IV Therapeutic Laser to help your pet heal more quickly and more effectively. Laser therapy reduces pain and inflammation, and improves mobility. The laser light stimulates the release of endorphins which relieves pain. It also helps cells heal much faster. It reduces swelling, boosts the lymphatic system (allowing edema to drain) and increases blood supply to injured tissues. Pets suffering from a wide range of conditions can benefit from this treatment. Conditions that respond well to laser therapy include arthritis, disc disease, skin conditions, lacerations, cystitis, burns and post-surgical healing. We have had great success with our therapeutic laser. The following is a testimonial from Linda Sugars of Invisible Fence. "After years and years of trying to find a solution for dear, sweet Tabitha, laser treatments have finally given her some peace and she is finally enjoying life in a multi-pet household. Tabitha is ten and she has never been a contented feline. Found at the Collingwood landfill we brought her home from the vet clinic when she was only four weeks old. Foster caring was a new experience for us and although we already had three other felines we decided to keep her. It took me several years before I finally admitted that she was not happy living with other cats. I thought that her tendency to stay in one room was an attempt to establish dominance in one part of the house and that the peeing was a marking activity. After many, many tests over and over again it was determined that she is a chronic sufferer of idiopathic cystitis. We tried everything including cosequin, various medications, needles and more. Finally we found some medication that worked….very expensive and strong. She hated the pills which only stressed her out more. Having the meds made into transdermal ear gels was better, but she hated having it put in her ear everyday and she just seemed more and more unhappy. For months I struggled with the realization that I was just making her more miserable and I seriously questioned whether she was having any quality of life. She would spend her day sleeping, leave the bedroom for food and growl and hiss and spit at the other cats and dogs. Although the peeing was less frequent it was still occurring. I had a chat with Dr. Gray during one of her open houses and she suggested that we try some laser treatments. They started this off when we boarded Tabitha at the clinic when we went away in February of 2011. A combination of the gels and the laser generated much better results. I was no longer cleaning up after her. We tried the laser over various time periods and have finally settled on a treatment every two weeks. Since the application of the ear gels were generating some anxiety with her I decided to eliminate them so it is just the laser therapy now which is a reasonable cost compared to all of the other treatments we have tried over the last few years. I now have a much happier cat! She no longer sleeps away the day, she is up and about and going outside on nice days, going into other rooms in the house and spending some time with the other cats when she feels like it. When we got a new puppy last year I thought that would set her back, but only for a little while. Although I know that she would be happier in a one cat household, I can’t part with her after 10 years and she has really bonded with me now. She no longer fights about going in the carrier and she adores Kaley, the Veterinary Technician who gives the laser treatments. She has a treatment on her bladder and her hips since we determined that her hips bother her too, There is finally some peace in our household and I am no longer cleaning up after her since she is using the litter pans consistently. I now feel that she is free of the daily pain of the cystitis. Should other problems develop with our pets I would definitely ask if laser would be a worthy consideration especially with the success that I have seen with dear Tabitha. Thank you to Dr. Tina and the staff of Blue Mountain Veterinary Services for persevering and finding a solution for Tabitha’s pain."